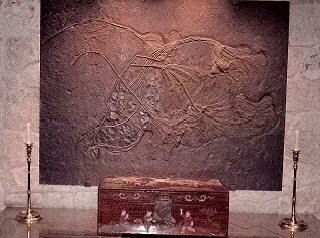 This Crinoid fossil was on loan to the Laurence Youngblood Energy Library at O.U. at the time of Loyce Youngblood's death in 2007, and was purchased then by O.U. for the library on behalf of a special group of University of Oklahoma donors.. This exceptionally fine multiple-calyx Crinoid from the beautiful domed entry hall of the Loyce L. Youngblood residence wassold in 2008 by the joint personal property heirsof the Estat of the late Mrs. Youngblood..
*These Crinoids were estate tax-appraised for $107,500 total after Mrs. Youngblood's death in 2007, and sold for $112,875. Description: Crinoids of the class crinoidea are in the phylum Echinodermata, which includes such radially symmetrical marine animals as sea urchins, starfish, and brittle stars. Crinoids are popularly called "sea lilies" due to their body's bulbous lily-like shape. These marine, invertebrate animals are found still living today, generally as individuals. They are usually bound to the sea floor by a stalk opposite their mouth, and appear in a variety of beautiful colors, thereby presenting a flower-like appearance. Crinoid fossils are sometimes golden-hued from absorption of iron pyrites ('"fools gold"), as in this Single-Calyx Crinoid specimen at the upper left, thereby giving the appearance of a golden lily. This Crinoid is of the species Seirocrinus subangularis, and it is of the family Pentacrinitidae. It is characterized by a globular body enclosed by a small calyx, from which freely moving "arms" extended upward to gather the marine animal's food. At the bottom of the jointed, flexible stem, but missing from this specimen, was a "root-like structure" by which it was attached to the sea bottom or sea floor plant material, and, occasionally, to driftwood. Specimens of this species have very long stems, tapering toward the top, up to 65 feet (18 meters) in length. 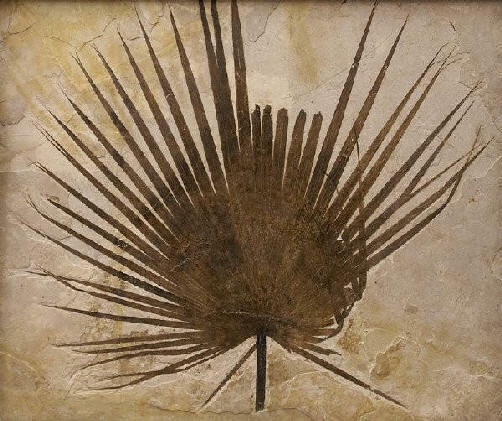 This 3 1/2 foot (1-meter) single-calyx crinoid is very well-preserved in a smooth, dark matrix consisting of fine-grained silts and clays which eventually formed bituminous (pitch-like) Poisidonia Shale, providing contrast to the golden-hued calyx-protected globular body. Some of the shale around the specimen has been removed in order to better display the crinoid, The shale matrix also contains small pelecypoda (clams) and Posidonia bronni. This specimen was quarried in an area of Germany containing a large concentrated volume of crinoids with exceptional preservation, most likely suggesting a rapid burial, probably by catastrophic mud deposition, perhaps triggered by one or more tectonic events. 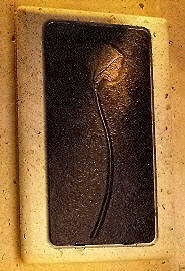 This specimen was purchased by the University of Oklahoma or display at the Laurence S. Youngblood Energy Library (O. U. geological library). This exceptional multiple-calyx crinoid at upper right (and in the expandable thumbnail at right) in carboniferous Holzmaden shale matrix, has nine well-preserved individual calyxed "Sea Lilies", and measures 59" W, 45" H, and 1.5" D. It was purchased by a private party in 2008. 1 Estimated by traditional Uniformitarian concepts (gradual, uniform changes over great periods of time, believed similar to rates of change observed today).